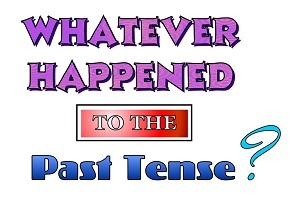 Whatever Happened to the Past Tense (And Is it Too Late to Get it Back)? Then there’s the ballet dancer who performs all her roles while wearing wooden clogs. The famous actor who will undertake any role, but will only go on stage if he is allowed to dress as Lady Macbeth; the review in the Times said, “Truly, this performance was the most terrifying portrayal of Tevye ever seen.” Let’s not forget the concert pianist who will only play pieces in the key of A minor. It should be obvious that any of these fictional artists is limiting his or her appeal to a mass audience by adopting eccentric rules for self-expression. Sure, it can be a valuable educational exercise for a painter to choose a restricted palette or theme; after all, that’s how we got Gainsborough’s “Blue Boy,” Picasso’s rose period, and all those Monet paintings of water lilies and Rouen Cathedral. But the benefit of such exercises comes from applying the techniques in other contexts. So why do business content writers so often impose limits on their own writing? This is not to say that content writers must make art their top consideration, but certainly an element of artistry ought to be in their bag of tricks for connecting with an audience. Yet most content writers take on restrictions every bit as confining as a ballerina wearing wooden shoes. Written in the passive voice, which usually also involves a “to be” verb. Example: Mrs. Graham’s leg was broken in the car crash. Verbs for the remaining few sentences will use the simple past or future tenses. Not much variety there. When we consider how using varied tenses not only helps engage your readers but also clarifies the sequence of events, then the monotony of the typical content piece is revealed as a tragedy. Before we can talk with precision about verb tenses, we need a little review of English grammar. Some languages signal tense by changing the form of verbs, a process called inflection or conjugation. English does not do that. Instead, English supplements the basic forms of verbs with other words that will specify the meaning of a verb phrase. In third grade, you probably were taught to call these extra words “helping verbs”; they are also known as auxiliary verbs or modals. Helping verbs join with the principal parts of a verb to express a definite meaning. The present or infinitive form. This is the simplest, most basic version of a verb: create, destroy, speak, sleep, walk, write, become, do, cut. The (simple) past tense. This takes the meaning of the verb and projects it into the past. Regular verbs add a -d or -ed suffix to create the simple past tense form: created, destroyed, walked. Irregular verbs may have past tense forms that need to be specially memorized: spoke, slept, wrote, became, did, cut. The past participle. This word can—among other things—function as an adjective. It is also the verb form that combines most often with helper words to form passive verbs or complex past tense expressions. Regular verbs have a past participle identical to the past tense: created, destroyed, walked. Irregular verbs may have unique past participles: spoken, slept, written, become, done, cut. That is right, “cut” is used for all three principal parts of that verb. Now, let’s investigate how the principal parts of a verb combine with helping verbs to create a broad palette of options for expressing yourself. Building it: It’s already at hand, in the form of the second principal part of the verb. Using it: It shows an action that took place in the past. Example: Jacob flew to New Orleans. President Jefferson left office in 1809. Building it: The formula is “was” or “were” + the present verb form + -ing. Using it: This is an alternative to the simple past tense. It is used to express an action that began in the past but hasn’t been completed yet or that was interrupted. Sally was sweeping the floor. If one event interrupted another ongoing action, use the simple past for the interrupting action and the past continuous for what was interrupted: As I was finishing my breakfast (past continuous), I noticed (simple past) a startling advertisement in the morning newspaper. Building it: “Have” or “has” + the past participle verb form. Using it: The perfect tense indicates an action that began in the past but is now completed (an old sense of the word “perfect”) at the present time. Examples: I have written a stern letter to the mayor about the parking situation. Meryl Streep has won many awards for her superlative acting. None of the attorneys at Zolopitz Law Firm has actually argued a case before a jury. Building it: “Have” or “has” + “been” + the present verb form + -ing. Using it: Use this tense when an action began in the past and has continued to the present moment. Young lady, I have been waiting for you to return home ever since you missed your curfew! Building it: “Had” + the past participle verb form. Using it: The past perfect describes an action that began in the past and has been completed before the present time. Example: After the death of her husband, Greta had donated all his clothes to charity. When two events both occurred in the past, use the past perfect for the event that happened first and simple past for later events: The lawyers had reached (past perfect) a settlement after all-night negotiations, and they informed (simple past) their clients of the details early Thursday. Building it: “Had been” + the present verb form + -ing. Using it: This tense is fairly rare. Its primary use is for situations where the action had been ongoing for a while but was completed in the past. Example: We had been trying to open the safe for 10 minutes before Jeremy remembered the correct combination. Building it: The simple past verb form; or “was” or “were” + the present verb form + -ing; or “used to” + the present verb form. Using it: Many languages have an imperfect tense to indicate actions that have been continuous— or occasionally repeated, or habitual—from the past to the present. English does not have a formal imperfect tense, but gets a similar result by using the simple past, the past continuous, or the words “used to.” Examples: Every night, Henry hugged his favorite stuffed animal as he slept. I have never missed a day of work. Tricia used to bite her fingernails when she was nervous. Wouldn’t it Be Better to Avoid This Complexity Altogether? Look at how quickly things became complex—and we haven’t even looked at future tenses! Along the way, we have seen that using past tense forms in the right order can give the reader insight into the sequence of events. If we rely on the simple past tense, we will lose that nuance. But maybe nuance is something that can be sacrificed at little cost. I have heard it said that it’s okay to simplify business content writing—even to the point of deliberately avoiding many verb tenses. Most of the people who visit doctors’ and lawyers’ websites are not strong readers, the argument goes, and so we should “dumb down” our writing to their competency level. That is not being patronizing; it is accommodating the needs of the audience. To which I say: No. No, no, no. Your readers are more sophisticated than you might imagine. They may not be able to define the pluperfect tense, but they have been immersed in the English language since birth. Instinct will guide them to recognize how tenses signal subtle time differences. If you fail to put in those markers, even weak readers will recognize bland, simplified prose—and they will look elsewhere for guidance. So don’t give into the temptation. Use your best writing skills when producing website content. That is one of the keys to attracting the clients and customers you need to maintain a viable business. Here at Foster Web Marketing, we don’t believe in secret formulas. We do believe in success. We definitely believe in sharing our insights to make everyone better at marketing their legal practices, medical clinics, and other small businesses. One way to begin a journey with us is to subscribe to our print newsletter. You will get it four times a year for free. Read it cover-to-cover and you will soon be learning key techniques to strengthen your marketing right away.